The ancient universe was confined within a finite spherical shell. The stars were fixed to this shell and thus were all equidistant from the Earth, which was at the centre of the spherical universe. 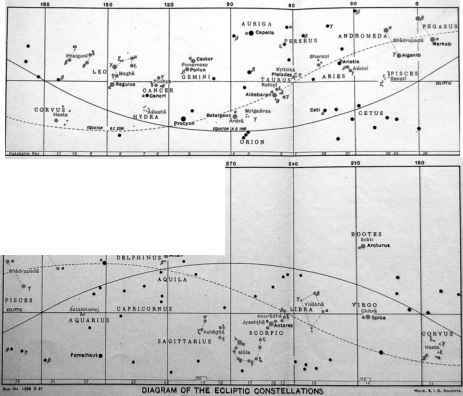 This simple model is still in many ways as useful as it was in antiquity: it helps us to easily understand the diurnal and annual motions of stars, and, more important, to predict these motions in a relatively simple way. Therefore we will assume for the time being that all the stars are located on the surface of an enormous sphere and that we are at its centre. Because the radius of this celestial sphere is practically infinite, we can neglect the effects due to the changing position of the observer, caused by the rotation and orbital motion of the Earth. These effects will be considered later in Sects. 2.9 and 2.10. Since the distances of the stars are ignored, we need only two coordinates to specify their directions. Each coordinate frame has some fixed reference plane passing through the centre of the celestial sphere and dividing the sphere into two hemispheres along a great circle. One of the coordinates indicates the angular distance from this reference plane. There is exactly one great circle going through the object and intersecting this plane perpendicularly; the second coordinate gives the angle between that point of intersection and some fixed direction.